You are thinking of buying a used continental car made in Germany and you combed through the Singapore famous car website that advertises dozens of them. How much can you trust some of the car dealers or the description that they have put up? No one will admit that the alternator is highly worn out, gear-box is slightly faulty and you have to top up the engine oil almost every week due to some leakage issues. Most of the time, miraculously, nothing would have happened during your test-drive session. But the vehicle starts to fall apart after a week on the road. Nevertheless, there are also very lucky drivers who have purchased really good conditioned second-hand car. You see, unless you are very technically sound with the anatomy and organs of car and you are able to sniff out the problems at the onset, it all boils down to luck for most of us as a layman. So, what other forms of decision-making tools can we harness to avoid buying a Lemon? Yes, you can go consult the i-Ching. The good news is you can DIY and you probably need about 10 minutes to do so. 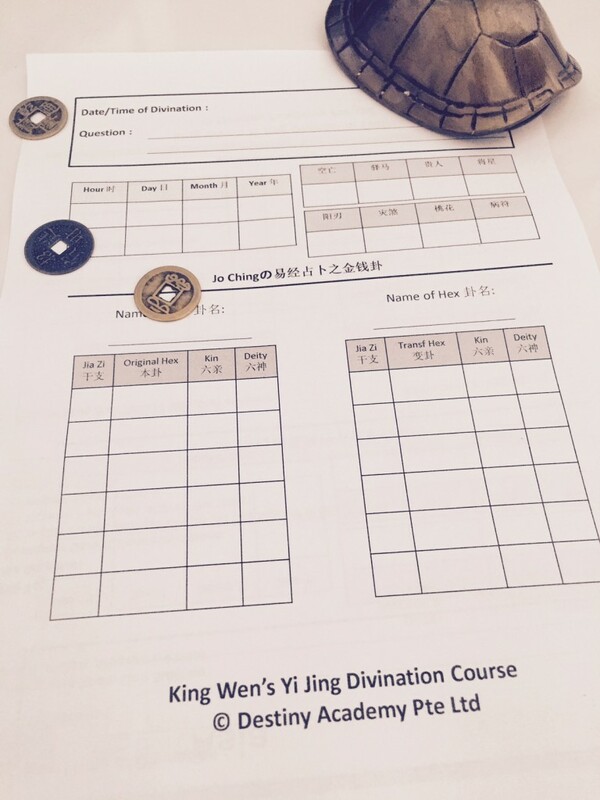 This entails the process of shaking the coins in a tortoise shell to arrive at a hexagram (this is the 6 lines that we draw on paper), fill up every line with an Earthly branch and Kinship, determine the subject matter, and read the answer or advice provided by i-Ching. Does one need to memorise by hard all the meanings of the 64 hexagrams in order to analyse i-Ching hexagram? The answer is “NO.” This specialized science of divination is also known as King Wen i-Ching Divination – a marriage between BaZi and i-Ching. It is not the philosophical part of i-Ching that we are learning but rather the operational aspect of it to advise us in day-to-day challenges. It is a consultative tool, a forecasting tool and a detective tool – to detect intrinsic issues in the car in this case or to detect what is wrong with the feng shui of the house, for example. All are done with a set of guidelines and formula so that it is straight forward and effective vis-à-vis Mei Hua Yi Shu which is less guided. So, what can we ask or find out from i-Ching about the car that we are going to buy? Is the car a Lemon (or plagued with defects)? Where likely is the problem of the car located? Will the car give my family good comfort? Has the car been met with accident before? Is this car lucky for me? Is the car dealer trying to con me? Above are some FAQs by clients and not exhaustive. The same approach can be applied to buying and selling of other items including property investment, stocks and shares which will be discussed in the class. If you are keen to equip yourself with a life skill to aid you in daily decision making, do consider joining us on 29 & 30 October 2016 for the class. You can click here to find out more on course outline or email academy@destinyasia.com.sg for early bird course fee. Remember, when in doubt, ask i-Ching.